This time of year signals in a fresh wave of warm weather here on the East Coast. People who have been inside throughout the winter like bears in hibernation, are seen everywhere. Parents are pushing their newborns in strollers while toddlers happily scream with delight as they attempt to escape their parents. Once in a while there are parties in the park. 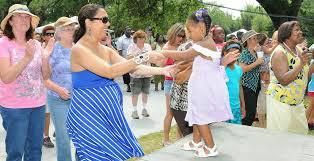 Mothers and daughters dance to music and they laugh in enjoyment over life,love and the happiness they find in each other. A form of gratitude that usually happens in selected moments of our lives. Once the moment has passed we have a tendency to forget what is truly worth being grateful for. We might remember that time in the park when we danced. The other day I was talking to my now twenty year old daughter. We had just had a beautiful day of weather here. She was telling me how she remembered going to the beach once the weather was warm. I would pack up my daughter and son with sandwiches, some juice boxes and a basket loaded with beach toys.It was not just a brief trip to the beach either. We would be there for a few hours. After a few warnings that it was time to go home, the moaning would stop, we would begin to pack up the toys and start the drive home. I think back with gratitude on those times. My life was simpler back then. I worked part-time and was able to spend hours watching my daughter and son grow. Now that they are older I am finding new experiences to be grateful for. I am trying at the end of everyday to literally count my blessings. These are not measured by the things I have in my life but rather through the quality of my relationship with others. That is how I count my blessings or express my gratitude. Whichever way you want to call it, it is something that is imperative to get done every day.